The month of May is a usually much-anticipated month in the temperate countries, where the first sprouts of greens peep out from the melting snow and ice of the winter months. 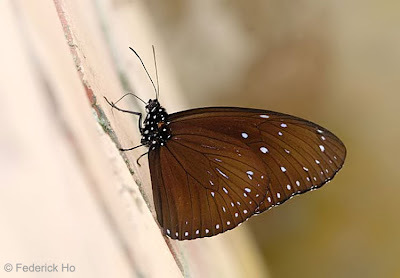 In Southeast Asia, it is the month of the intermonsoons, as the winds change and weather can get unpredictable - searingly hot for a few days, followed by thunderstorms. May is also the month where we celebrate Mother's Day - a time where we pay tribute to every mother's sacrifices and efforts in nurturing the family and juggling a thousand and one things in their daily routines. 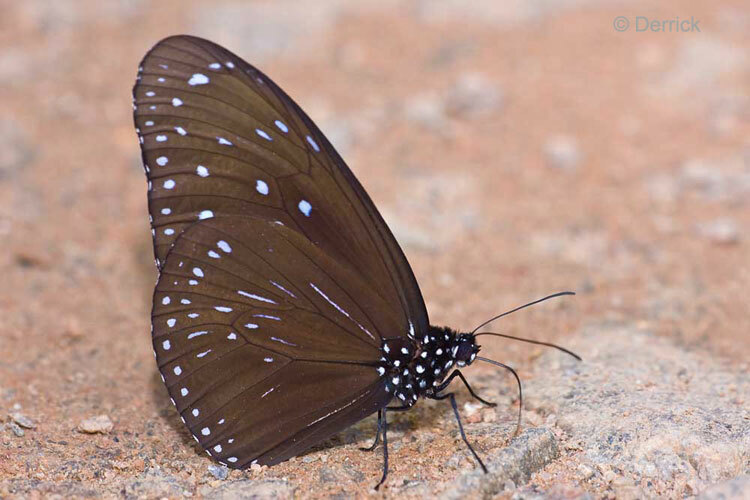 This month, we feature a species of the Danainae subfamily, the Striped Blue Crow (Euploea mulciber mulciber), This rather large butterfly is sexually dimorphic i.e. 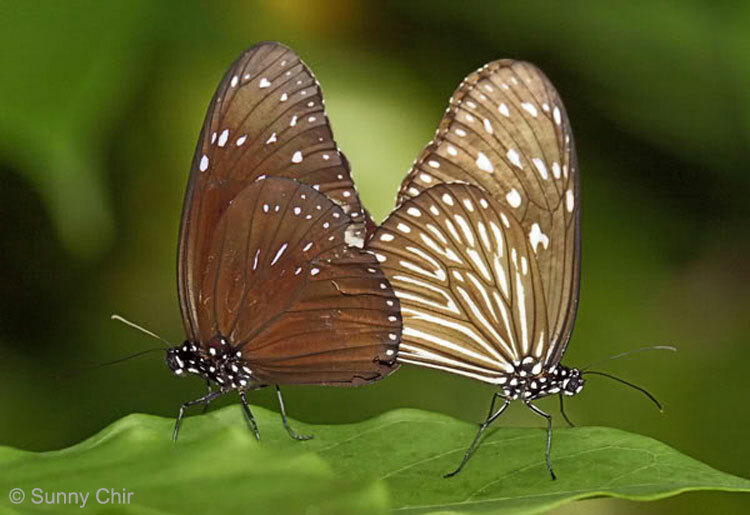 where the male and female look different from each other. The Striped Blue Crow displays aposematic colouration, typical of the genus Euploea of which the species of the genus are usually distasteful to predators, primarily due to their caterpillars' diet of lactiferous host plants. The Striped Blue Crow is the most common species of the genus Euploea, also known collectively by their common English name of "Crows" - probably due to the fact that many of the species are typically black. The species can be found in urban parks and gardens as well as in the forests within the nature reserves of Singapore. 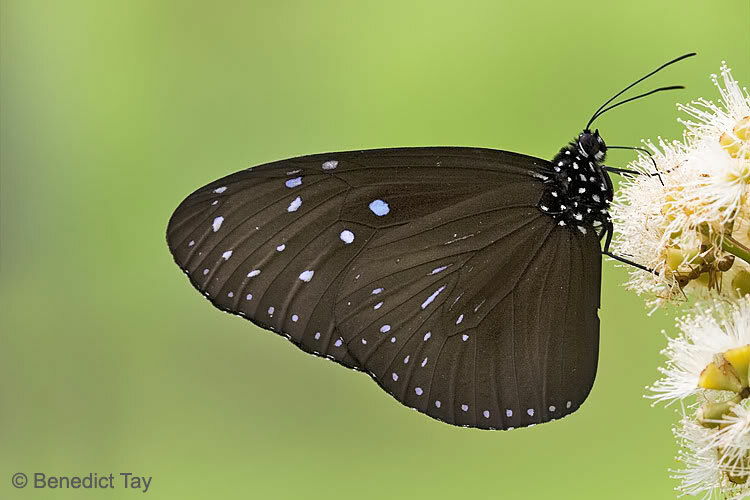 The common English name of this butterfly was probably derived from the female of the species, whose hindwing is striped with narrow white streaks. 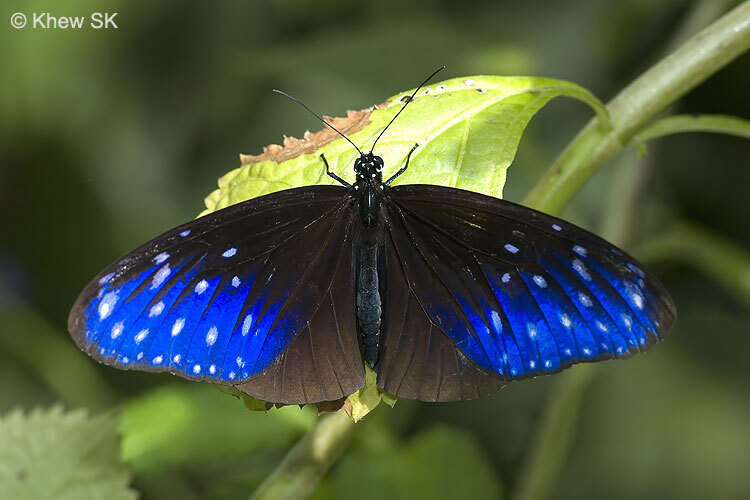 The upper side of the post-discal portion of the forewings is blue-shot, more distinct when illuminated by a side light, with prominent white spotting. Males are even more attractive, with deep blue iridescent forewings that are quite spectacular - visible even when in flight. The underside of the male is rather drab, with the usual dark brown colours of the "Crows" spotted with the typical white submarginal spots. 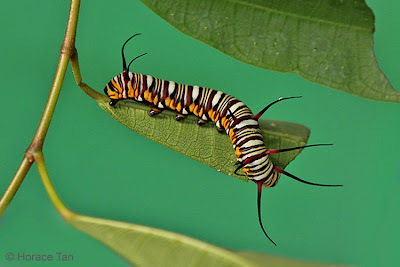 Occasionally, males of the species are observed puddling at muddy footpaths and banks of streams that have been tainted with decomposing organic matter. 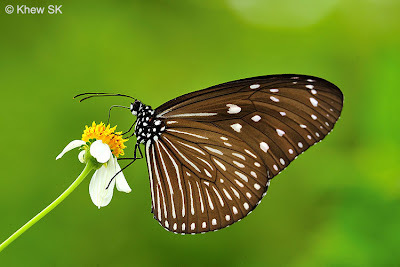 The butterfly has a slow and unhurried flight, and is fond of wild flowers like Bidens pilosa and flowers of the occasional-flowering Syzygium trees and bushes. 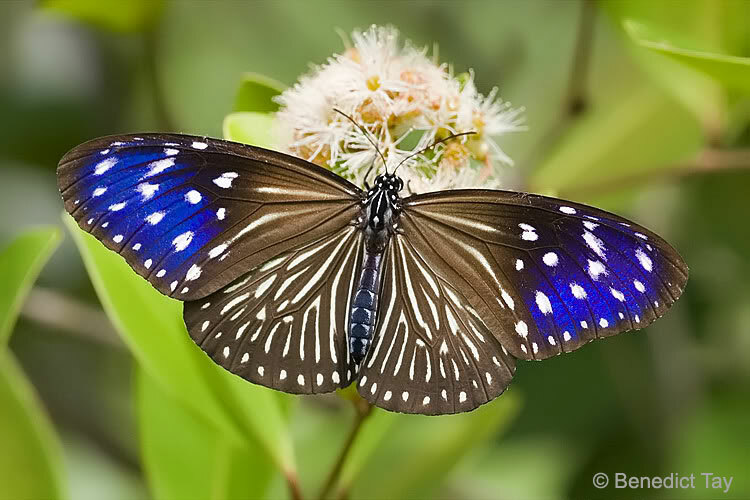 The Striped Blue Crow is also attracted to the flowers of Heliotropium indicum as well as the dried plant - often hovering around persistently and returns to the plant even when disturbed.